It’s a busy time of year on our various sites and it’s good to see so much progress being made with plots. In July, some of our sites will be opening as part of Frome Festival’s Hidden Gardens. Orchard Street opens on Friday 7th July, Mendip View and North Hill open on Saturday 8th while Welshmill opens on Sunday 9th July. Last year we raised over £650 for various cancer, nursing and gardening charities through opening as part of this scheme. The full story of our opening, with photos, can be found in the July edition of Kitchen Garden magazine, currently on sale. It’s been a testing time for us all with the mini-drought followed by the mini monsoon. Alan Balura has organised water storage for the top ten plots at Muriel Jones. The committee has now decided to extend the scheme, halfway down each side, with tanks of 6000 litre capacity, at a cost of £1600. This cost was unanimously agreed by the committee. At Welshmill the new pump is working well and will hopefully be more robust than the previous model. At Queen’s Road, posts and timber have been ordered for the fence. At North Hill, a plot holder has removed the old metal fencing and the lock and chain have been replaced. At Orchard Street, Frome Town Council has completed the work to improve access. The funding bid prepared by Rick Anderson and Steve Neal to Somerset Community Fund was unsuccessful. The outreach programme, including the course for parents at Welshmill, will still run but in a slightly modified form. Earlier on in the year, Neil Cameron sent out an open letter to members asking if anyone would like to join the committee. Elaine Rutland, Alan Balura Julia Gray responded and have now joined the committee. Julia is looking after the Facebook page and Elaine has taken on the role of site manager at Muriel Jones. 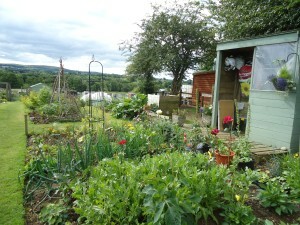 Spring is in the air and it’s a busy time on Frome’s Allotment sites. Here’s our newsletter to let you know what’s going on. By now you should have received your agenda for AGM at Trinity Hall on 29th March 7pm, so we look forward to seeing you there. It’s always a good time to have a chat with your site reps and catch up with your fellow plotholders. In the same envelope as the agenda is the invoice for the rent on your plot for the next year. This year Gerry Gasson, the treasurer, has introduced a pay by bank transfer facility. But you still have the option of paying by cheque or cash if you prefer. In November Neil Cameron, chair, spoke at a meeting of Frome Town Council and outlined the work of FAA volunteers that keeps the allotment sites running. In the past two years FTC has funded the outreach worker role but has now changed its system for funding local groups. FAA has now put in a bid to Somerset Community Foundation for funding for the outreach worker for this year. Some funding has already been secured from Bristol Fostering. In the past we have supported Frome Festival by participating in Hidden Gardens. This year we will be opening Mendip View on Saturday 8th July and Welshmill on Sunday 9th July. In addition North Hill and Orchard Street may be opening. Please contact your site reps if you wish to be involved. This year it takes place on Tuesday 4th July from 11am until 5 pm and there will be teas and an exhibition of photos. http://www.ngs.org.uk/gardens/find-a-garden/Garden.aspx?id=33166 It was a great success last year raising over £650 for various charities and attracted 95 visitors, most of them from outside the area. If you want to bake a cake or help on the day then please contact Gerry Gasson. Hedges and brambles have been cut at Queen’s Road the fence will be refurbished first two weeks in April. At Muriel Jones Fields a mini digger was used to sort out the banks of soil at the side of the site. Metal panels dumped at North Hill have been recycled by a plotholder. At Welshmill a group of volunteers tidied up the site and filled a skip with rubbish. Wheelbarrows have been bought for Muriel Jones and Welshmill. This is currently around 80. Have a good growing season. !